A couple of years ago I first visited the Gonzales Memorial Museum. I wrote a blog post about it, the cannon and flag that was used in that battle the museum commemorates. The story is something I've thought a lot about since then and so I decided to explore it further in the most recent episode of The Works. As always, feel listen to other episodes or subscribe to the podcast on iTunes where you can also rate the show and leave a comment. There is a interesting little museum in Gonzales, Texas that tells the story of the role the town played in the fight for Texas independence. In 1835 Mexican forces were dispatched to Gonzales to retrieve a canon. 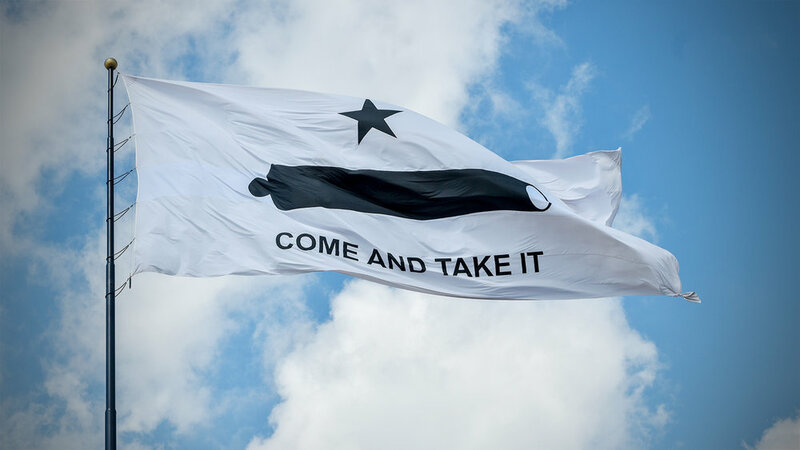 The city militia refused and in the subsequent skirmish the rebel forces created a flag that pictured the canon with the taunt, "COME AND TAKE IT" embroidered upon it. When I recently visited the museum I remembered some of the story from my 7th grade Texas History class but as is often the case, the truth is more complex and much more interesting. In 1835 Mexican forces were dispatched to Gonzales to capture a canon. The city militia refused and in the subsequent skirmish the rebel forces brandished a flag that pictured the canon with the taunt, "COME AND TAKE IT" embroidered upon it. The Gonzales Canon was on loan from the Mexican Government. Although hostilities had been building between the two sides, war had not officially broken out between Texas and Mexico and the Mexican Army was only trying to collect what was technically still theirs. 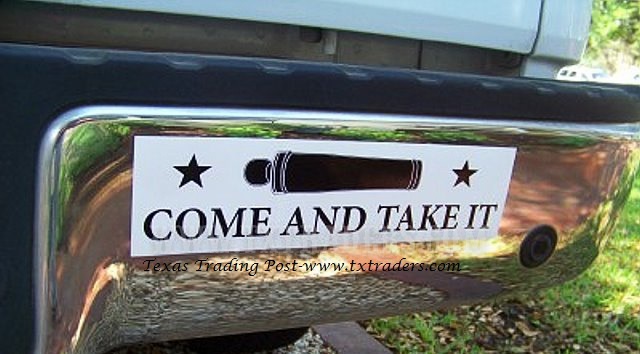 Granted the Mexican Army was in Texas to suppress a potential rebelion, but in Gonzales at least the guv'ment wasn't coming for anyone's guns but their own. As a weapon, the Gonzales Canon was useless. The canon was originally lent to the people of Gonzales in 1831 so that they might better protect themselves from periodic indian raids. But the canon was small - only six pounds - and its usefulness in dispatching a Comanche riding in on horseback would be minimal at best. There is some evidence that the canon might also have been spiked. Either way, the canon could really only be used to scare the attackers or at least frighten their horses. Its bark was worse than its bite. As far as canons go, the one in Gonzales Canon was also really small. The six pound canon was only about 17" long. An M-4 carbide - the weapon often depicted on updated versions of the "COME AND TAKE IT" flag - can be almost twice as long depending on its configuration. Put another way, the canon on the flag was larger than the real canon it depicted. I can't help but smile whenever I see the flag on a bumper sticker of a large truck or otherwise used as a symbol of defiance. Symbols are good - especially when they are well designed - but the story behind those symbols should be fully understood before they are deployed.